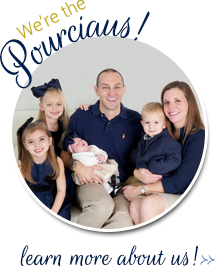 The Pourciau Family: Happy National Donut Day! According to MSN, today is National Donut Day. 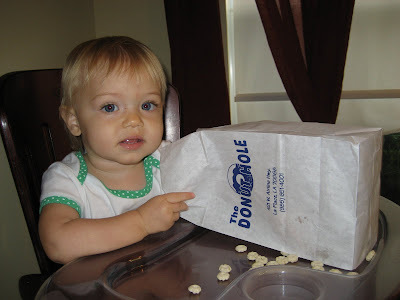 Stella and I had to celebrate by heading out to our favorite breakfast spot, the Donut Hole, and visiting Mr. Jim. 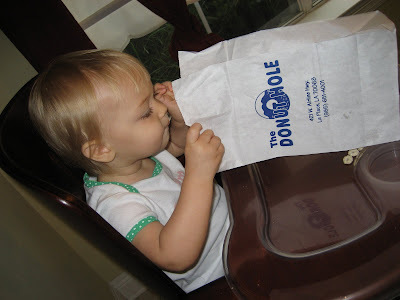 Because of Stella's unfortunate food allergies, she could only participate in the donut eating by exploring the bag. And this face says, "Seriously, Mom, this is not funny. Give me a donut." We hope that your National Donut Day is full of sweet surprises. Awww...so sad she can't have a doughnut! :-( What else is she allergic to besides milk? I wish I would have known...I'm off today!